The session on Monday remained much on expected lines. The Markets opened lower in line with global weakness but did not breached its opening lows and ended with net loss of 94.05 points or 0.87%. The benchmark NIFTY50 came off nearly 80-odd points from the lows of the morning. In our previous note, we had mentioned above NIFTY attempting to form a base around current levels. 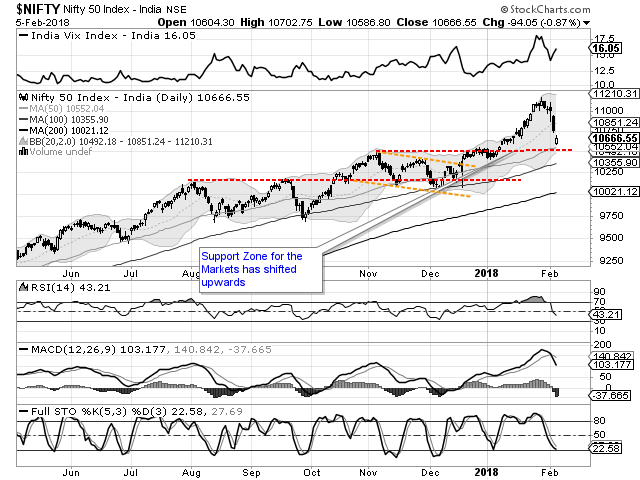 In line with this reading, NIFTY did fiercely attempt to form a base in the 10550-10650 zones. The selling was present in Monday’s session but was not an indiscriminate one and select pockets grossly out-performed the general Markes. Going into trade on Tuesday, we see a quiet to modestly positive start to the trade. With the levels of 10710 and 10765 acting as resistance, we expect a pullback that began from lows of Monday to continue. Supports exist at 10610 and 10550 zones. The Relative Strength Index – RSI on the Daily Chart is 43.2131 and it has marked a fresh 14-period low which is bearish. It does not show any divergence against the price. The Daily MACD stays bearish while trading below its signal line. On Candles, a falling window occurred. However, in the present nature of formation, it holds little significance. The pattern analysis shows NIFTY attempting to form a base around 10550-10650 zones. This zone is likely to act as strong support base as this was the point from where the Markets had initiated its latest upmove. All in all, we expect the Markets to consolidate its present status and find a bottom. It is also important to note that the current correction is because of not just domestic factors or out of reactions to Union Budget but also a part of global risk-off that is taking place. We recommend preserving cash and utilize all dips to make quality purchases. We expect that sectoral out-performance will continue. Though volatility might continue to purchases, good quality stocks will find bargain buying at lower levels.